Did your ancestors come from Lithuania? Do you want to know more about your Litvak heritage? 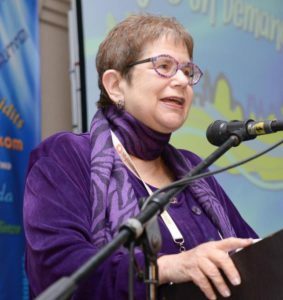 Judy Baston will present an overview of the LitvakSIG website and related resources, including the All Lithuania Database (with its 1.5 million translated records), district research groups, JewishGen and Yad Vashem. Learn how to determine what records are available, how best to access the information, and how to optimize searches and understand the results. Judy Baston has served in leadership positions in LitvakSIG and Jewish Records Indexing-Poland for over 15 years. She has moderated multiple discussion groups and coordinates several district research groups. She is the 2015 recipient of the IAJGS Lifetime Achievement Award. Browse family histories written by your fellow JGSGB members and view family heirlooms and keepsakes that connect us to our ancestors. Exhibit will be open before and after the lecture. If you’d like to donate your work or precious objects for the afternoon, contact exhibit @ jgsgb.org . Click here for more information.